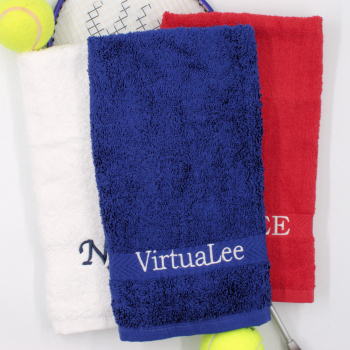 Personalised Royal Blue cotton gym towel. This sport or gym towel is made smaller than a normal bathroom hand towel in a handy 60x40cm size, ideal for taking to the gym and not taking up too much space in a sports bag. Made from 550gsm ringspun terry cotton for durability and performance, this gym towel is an essential piece to any work out. Please enter in the option box the exact name, nickname or initials you would like sewn and choose the embroidery thread colour and font style you want for your text.